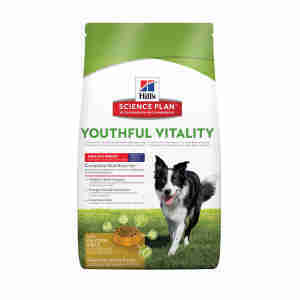 The Hill’s Science Plan™ Youthful Vitality Medium is a dry complete dog food recommended by veterinarians which can improve the overall health of the medium breed dogs over 7 years. This innovative formula was scientifically developed to reduce the negative impact of the ageing effects. It contains a blend of selected ingredients such as antioxidants and unsaturated fats which can help your dog being well nourished. The kibble includes also components, such as Vitamin C + E and a blend of dried ingredients such as beet pulp, carrots, tomato, spinach which are easy-to-digest and improves the absorption. In their late years, around 7 years upwards (for medium size breeds), you might remark changes in your dog’s behaviour, sleeping more and being less active. It’s good to give your furry friend a little bit of care in this phase. Hill’s Science Plan™ Youthful Vitality Medium recipe comes with an innovative combination of ingredients which can boost your dog well-being. Having enough vitality and mobility your dog can stay active and be happy. Also maintaining good brain function and balanced digestion, with nutrients and vitamins, this blend can help shrink the effects of getting older. Composition: Maize, brewers´ rice, chicken andturkey meal, barley, oats, digest, dried whole egg, vegetable oil, animal fat, flaxseed, minerals, dried beet pulp, dried carrots, dried tomato pomace, dried citrus pulp, fish oil, dried spinach. Additives per kg: Nutritional additives: E672 (Vitamin A) 40,861 IU, E671 (Vitamin D3) 2,151 IU, E1 (Iron) 242mg, E2 (Iodine) 3.6mg, E4 (Copper) 30.7mg, E5 (Manganese) 10.7mg, E6 (Zinc) 206mg, E8 (Selenium) 0.5mg, with natural antioxidant. Analytical Constituents: Protein 20.0%, Fat content 12.8%, Crude fibre 1.6%, Crude ash 5.0%, Omega-3 fatty acids 0.81%, Omega-6 fatty acids 3.54%, Calcium 0.84%, Phosphorus 0.60%, Sodium 0.18%, Potassium 0.74%, Magnesium 0.09%; per kg: Vitamin E1,265mg , Vitamin C 360mg, Beta-carotene 1.5mg.